November 2, 2010.Hope everyone had a safe and fun Halloween! We started packing up the store at about 9am yesterday morning until about 10pm and then finished up last few things this morning. This afternoon we drove the U-Haul,U-Haul trailer and a van full of candy to storage and unloaded all the candy. 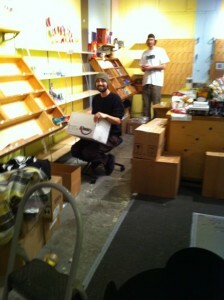 Thanks to Willy for his master packing skills and handy drawing everything fit perfect! While we were unloading the candy the demolition began back at the store! It’s very exciting to see everything getting underway. Stay tuned to see how demo is coming along! WOO WOO candy shop website!! Who knew? Pictures look awesome.